Holy cow!!! I found me a hidden gem! I'm honestly not sure why this one didn't catch my eye before now, but as soon as I started reading 'Undertow' which is book #2 in this series and one that did catch my eye. Enough so that I said yes please when asked if I wanted to review it, however, I'd barely started reading 'Undertow' and I knew I'd screwed up by not reading the first book...so, my recommendation is if you're interested in reading 'Undertow' read this book first. 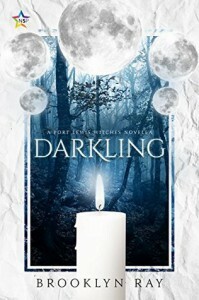 'Darkling' is the first book in Brooklyn Ray's 'Port Lewis Witches' series and I'm happy to say it was worth putting 'Undertow' on hold for a day while I went back and read it. "Port Lewis Witches" is one of those series where the stories really are connected and the characters go from story to story so much of the background and what happens in 'Darkling' is relevant to events in 'Undertow' and at less than 100 pages each it's not a big task to take the time to read both books but so worth it. For me it's been a while since I've gotten so excited about a book of this genre. On a more general scale 'Port Lewis Witches' would be paranormal, but this isn't your vampires, werewolves, shifter paranormal...no this series is predominantly 'witches'!!! While it's not that witches are obscure or anything like that but in general they don't tend to be as popular as other creatures of the paranormal world. So for me it's that little step outside of the norm box that can often times make things interesting. While I'd love to talk more about the actual story that's not going to happen because at just under a hundred pages this is one tightly written story with little to no superfluous information. Essentially Darkling is Ryder's story but we can't have Ryder's story without being introduced to Liam, Christy, Tyler and Donovan. These are the members of the circle that he belongs to and Liam is also his love interest. While we're given a solid background for each of these characters trust me when I say there's more to come and for this book Ryder is definitely the focus. I really like all of these witches and I love that they each have their own talent some of which won't be fully revealed in this story. Just like with us normal people at the heart of so much of what goes wrong are secrets...secrets about their magic, secrets about themselves...who they are and what they can do or what they may become...so many secrets and this story plays out against a background of secrets coming to light and changing so much of what these young witches know to be real. Brooklyn Ray is a new to me author and this first foray into her writing world has been a wonderfully enjoyable time for me and I'm very much looking forward to finding out what comes next with this circle of witches. Ok so that's my ramble about 'Darkling', so while it's a quick read at less than 100 pages. I've read books that were twice as long and been lucky if I got half as much story so definitely recommended...especially if you plan on reading 'Undertow'.